A timeline of a shooting rampage at Inland Regional Center in San Bernardino on Wednesday, Dec. 2, 2015. 11 a.m.: San Bernardino police receive a report of a shooting at the Inland Regional Center, 1365 S. Waterman Avenue. 12 p.m.: Dozens of people seen filing out of the regional center. 12:25 p.m.: President Barack Obama briefed by Homeland Security on the active shooting situation. 1:55 p.m.: Officials announce during press conference that 14 people were killed, and that the suspects were at large. Courts, schools and other facilities placed on lockdown. 3:15 p.m.: Police chase ends in dramatic shootout that killed two suspects and injured one officer. A male suspect's body was seen on the street, and a female suspect's body was pulled out from a bullet-riddled SUV. 5:30 p.m.: Officers search a home in Redlands in 50 block of N. Center Street, believed to be connected to the shooting rampage. 7:45 p.m.: One suspect identified as Syed Farook, the Associated Press confirms. 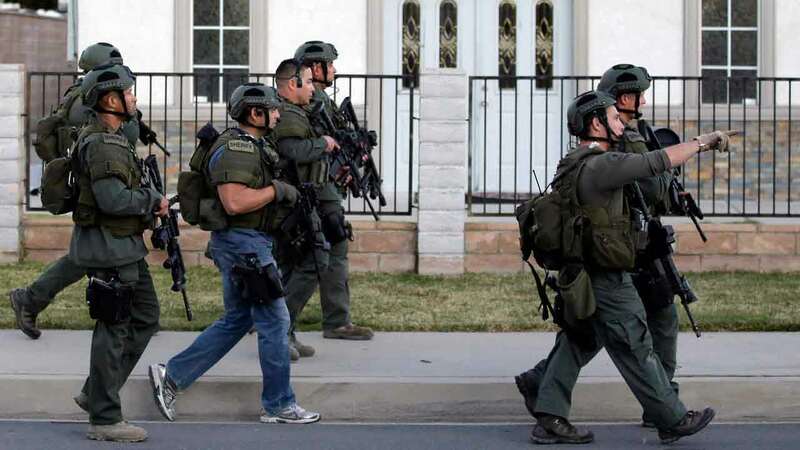 10:05 p.m.: San Bernardino police confirmed two suspects were Syed Rizwan Farook, 28, and 27-year-old Tashfeen Malik. The pair may have been married or engaged. 10:15 p.m.: Officers said they are "reasonably confident" there were only two suspects involved in the mass shooting.